As the dust settles at Wimbledon, the real tennis action is under way: the world's best players of the original sport are duelling it out at the game's spiritual home. 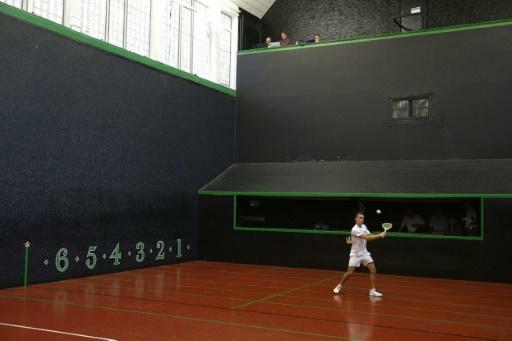 Real tennis, the historic forerunner of the modern sport, is still played on a few dozen courts across the globe, including at Hampton Court Palace in London. On a court originally built in 1530 for king Henry VIII, the top players are laying chases and hitting boomerangs, giraffes and railroads -- some of the sport's quirky moves. "It's the best game, ever. Simple," said world champion Rob Fahey, considered the sport's all-time greatest player. "It's the beginning of everything," the 50-year-old Australian told AFP in the palace grounds. "The most important thing is to realise it isn't tennis," he explained. "It looks a lot like tennis but a lot of games have derived from this so we've got elements of squash and any other racquet sport you can think of. You've got to be a master of all trades." The Royal Tennis Court at Hampton Court Palace was built by kings, for kings to play on. It is the real tennis equivalent of Wimbledon's Centre Court: the spiritual home of the game. The Champions Trophy, disputed on the historic court and featuring the world's top players, runs until Sunday. It is one of the sport's 10 tournaments earning ranking points. 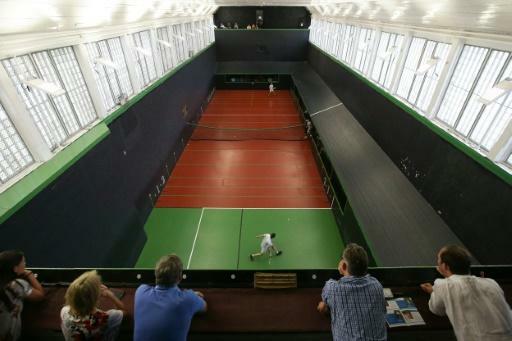 Real tennis survives on fewer than 50 courts worldwide: around half are in Britain, with others in the United States and a few in Australia and France. The Royal Tennis Court is the busiest in the world, in constant use 364 days a year. Clubs need to make their own balls, which are hard and solid, unlike lawn tennis balls. Weighing 81 to 88 grammes, they are comprised of crumbled wine corks, tightly wrapped in cling film and tied in twine, bound in cotton tape, then stitched into yellow felt. "A well-made ball has to survive quite a robust game," said Nick Wood, the head professional at the Royal Tennis Court, as he finished making a ball. The marker, a fellow pro who officiates over a match, needs quick reactions, ducking out of the way of shots. "There is a certain amount of bravery," Wood said. "The ball comes off the racquet at up to 100 miles (160 kilometres) per hour. It's like an Exocet missile coming straight at you. It will break bones." The sport still uses wooden racquets with a small, angled head. Lawn tennis-style graphite racquets were tried but they were judged too powerful and "destroyed the grace and skill of the game", said Wood. The sport evolved as a street game played in medieval European courtyards, hence its asymmetrical layout, with what looks like a row of small shops along two sides whose windows and roofs are part of the court. Its French name, jeu de paume, refers to the time before racquets when it was played with the open palm. There were once 250 courts in Paris alone; there are now two in France. Rather than play in the dirty streets, the nobility had their own courts built. Real tennis claims several common phrases originate from the game: cut to the chase, off the wall, in the nick of time, from pillar to post and impress the gallery. The sport declined in the 20th century as lawn tennis took over, but since the 1970s, new courts have been built and the game is growing. Real tennis historian Lesley Ronaldson said lawn tennis was a simplified and therefore less complex sport. "Real tennis has so much to offer," said the four-time British Open champion. "Having to be fit, the mental game like chess and having to learn the techniques makes it altogether a fascinating game." Fahey won the biennial world championship -- played over 13 sets across three days -- unbroken from 1994 to 2014. He won the title back from 31-year-old US rival Camden Riviere in April. "We're very passionate," the Tasmanian said, of the sport's 100-odd professionals and 10,000 or so enthusiasts worldwide. "A game like this could fall off a cliff and potentially disappear, which would be heartbreaking because it's the original sport. "We've got to work hard to keep it alive."